Launched in 2013, the Peninsula Dental Social Enterprise (PDSE) is the first of its kind in the UK. Launched in 2013, the Peninsula Dental Social Enterprise (PDSE) is the first of its kind in the UK. Housing a clinical education entity in a social enterprise means that undergraduates studying for a career in dental health – dentists, nurses, hygienists and therapists – are able to treat patients when supervised by a trained practitioner. 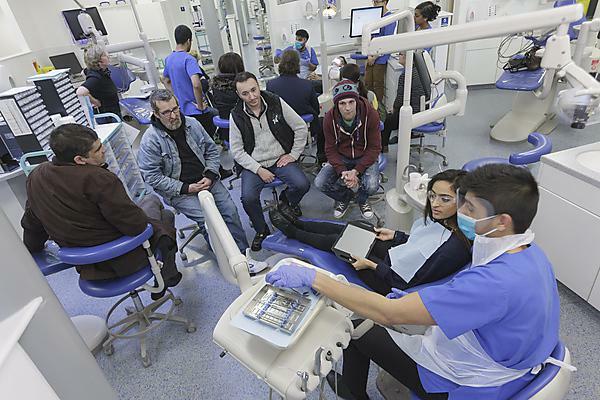 During the past year, 235 dental students from the University carried out around 40,000 procedures across almost 85,000 appointments. By aligning its community outreach in this way, the PDSE is helping to address one of the key indicators of health inequality in the South West. Also part of the curriculum are interprofessional engagement projects, where teams of students work with community groups to raise awareness of oral health. Local schools, organisations for the elderly such as Age UK, the Salvation Army and charities working with vulnerable members of the community have all benefited from sessions that address psychological issues and provide dental packs and other forms of treatment. In another show of support for local charities, at the end of 2014 the PDSE supported South West Big Issue sellers by providing them with 100 new tabards, each of which bore the slogan ‘Oral health is a Big Issue, look after yours’.